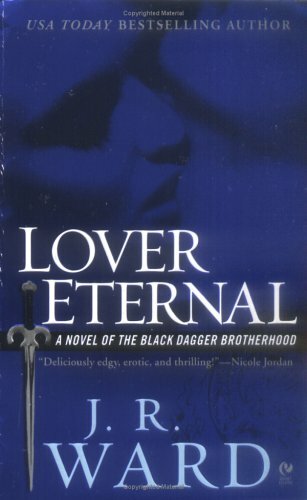 Lover Eternal is book two of the Black Dagger Brotherhood series. It picks up about where Dark Lover left off, which amuses me a little bit, because after how many centuries of the same ol’ thing, the Brothers suddenly have craziness going on all at once? Why yes, yes they do. I hope later in the series there is some explanation for all the crazy that suddenly happens in their lives–’cause as I understand it, each book takes place almost immediately after the preceeding one. Anyway. I digress. Lover Eternal tells the story of Rhage, a.k.a. “Hollywood,” the Brother with movie-star good looks, the Brother who has the reputation for being the most promiscuous. Rhage managed, in the early nineteenth century, to tick off the Scribe Virgin (the deity and creator of the vampire species), and so she punished him by saddling him with the Beast. When Rhage lives up to his name and looses control of himself, he transforms into a huge dragon-like creature that is pretty much just a mindless killing machine. To keep the beast from coming out to wreak havoc, Rhage must keep his violent and sexual appetites in control; it is a control measure and pressure valve. The novel is also the story of Mary, a human woman, who through her altruism, finds herself smack in the middle of the world of vampires and their enemies, the lessers. I like Mary. I sympathize with her and admire her. Like so many protagonists in paranormal romances, she’s had a tough road to walk and has come out stronger for it–though it has also taught her to cut herself off from even the idea of a successful romance. Given the genre, it’s clear that her attempts to keep herself walled up and separate from Rhage and her attraction to him is going to fail, and fail spectacularly. Knowing their union is inevitable, however, didn’t take away the enjoyment of reading their story. It helps, I think, that in addition to the romance, Ward also takes the time to develop sub-plots that will continue to grow and affect the lives of these characters in the next installment(s). I was pleasantly surprised, too, that the biggest sub-plot in Lover Eternal isn’t resolved at all, and you have to wait until you get to the next novel to find out what happens. It makes me happy I didn’t find the series until long after book three was published; I would’ve been climbing the walls with that kind of cliffhanger had I read the early books as they were being written. Over all, I liked it. The second installment in the series is as engaging as the first. Action-oriented, a good treatment of the genre’s cliches and expected HEA resolution, and a tight pacing. Things I like. Personally, I could do without the omniscient narrator spending so much time in the bad guys’ heads, but I’m like that with most novels I read, so it’s nothing particularly bad in this series. it is solidly entertaining read. I’m farther into the series now–I wrote the review ahead of time–and book six about killed me. The pacing of Phury’s story just seemed off. Stilted, in comparison to the first few. I started Lover Avenged, though, so I have hope that it was just an aberration and that one book.